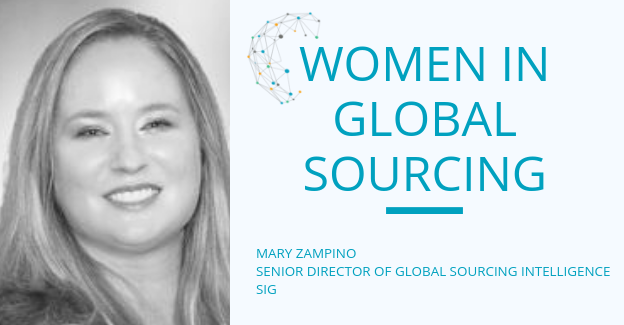 Future of Sourcing Digital is pleased to welcome Mary Zampino to the "Women in Global Sourcing" stage. This series strives to highlight, celebrate and acknowledge women who are pioneers and leaders in the industry and who have been influential in moving the industry forward. Mary embodies this series in all that she does in her current role, her impressive past and her continued drive for education and learning. Mary is the Senior Director of Global Sourcing Intelligence at SIG and has over 20 years of experience in information technology and over 15 years of experience in sourcing. She holds a Bachelor's Degree in Information Science from the Florida State University and has completed certifications in Health Information Technology and Requirements Gathering. During college I landed a job at a small software company and several of the network engineers there introduced me to coding (then called "programming") and networking. I also honed my word processing skills and learned Microsoft Office. I became a whiz at documents and spreadsheets. That company moved to another city so I took a job with the state of Florida working desktop support in the statewide purchasing office. At that time, Florida was a pioneer in posting open bids, proposals and contracts on the internet. It was a very exciting time, as I was learning about the internet and public purchasing. One day, our chief procurement leader invited me to join him in a meeting with Governor Bush. I thought to myself, "Wow, this industry has a lot of influence." The meeting was about increasing spend with minority vendors. Since I grew up in “the sticks” and saw how the system had left minorities often powerless, I had been looking for ways to make a difference. It dawned on me in that meeting that purchasing had a ton of power and could influence real change. After I graduated college, we moved to a bigger city and I eventually landed an interview at a start-up in 2001. Initially I was scared off by the words "start-up" as literally the infamous bust had just happened a few months before. But they wanted to fly me to Chicago for a day of interviews and, as it is my hometown, I went. All day long I went from one meeting to the next, during which they mapped out a brand new concept called Software-as-a-Service purchasing and talked about group purchasing and demand management. Over the next ten years I conducted thousands of reverse auctions, built a bid management system in our procure-to-pay suite, and learned how to write a good SOW (you can't auction what isn't defined). Since I worked for sourcing professionals as a provider, I had a crash course on every category out there – from printer paper to pad transformers and from facilities management to road construction. It was a fantastic job and I made a lot of great connections. One of those connections was a current member of SIG, who introduced me to our CEO, Dawn Tiura. We clicked right away, and I admired her vision and passion. For the last nine years I have been shaping the content for SIG's Global Summits, curating our resource center, conducting research, analyzing trends and documenting the findings. I also have the extreme privilege of managing peer discussions, so I get this exceptional insight into the issues and concerns of our members – and better yet, the proposed solutions! When I was in school, I was actively discouraged from participating in math and science classes. I excelled in history, literature and language arts. So I wasted a lot of time ignoring innate business and project management skills I didn't even really realize I had. However, when I started working and using practical skills, I began to appreciate more of my process-mapping, analytical skills. I really wish I had had more practical training before I had to start spending money on school. Because of my family's circumstances, I couldn't waste a penny "finding my path." What I do appreciate is how I have spent time both as a buy-side practitioner in a contracting and a support role, and as a provider. The insight you have as a practitioner is critical to being a successful provider. If you can walk the talk, you are much more authentic. I learned this when I was conducting roadshows explaining reverse auctions to sourcing practitioners who had literally sourced billions of dollars in spend and dozens and dozens of categories in their decades-long careers. What has been the single most significant development to impact your profession or area of business during your career and why? People. I have been very fortunate to work for and alongside some incredibly generous people. When I look back at the things that change my path, and opened up a new opportunity, it's because someone recognized my skills and hard work. I am very grateful to them all. What’s the biggest challenge facing your industry today – and how do you plan to solve it? I think the greatest issue facing this industry is a lack of investment in people. We need to create environments where sharing is rewarded and where people feel comfortable taking calculated risks and spending money that may not have an immediate return on investment. It's difficult with sourcing professionals because we are taught to keep ourselves anonymous, our strategies secret, our terms elusive – all in a bid to keep the upper hand. What do you consider to be your greatest achievement career-wise? What I am most proud of today is the respect I have of my peers and my customers. What’s your biggest (as yet) unfulfilled ambition – and what are you doing to achieve it? Personally, I want to write a book. Professionally, I want to convince every professional in sourcing – from people who buy stuff to the people who sell stuff – that sharing is critical to innovation and innovation is critical to relevancy. In every conversation I have, I try to demonstrate the importance of creating a trusted environment where we can constructively share ideas, insights, problems and solutions. Sourcing has an incredible opportunity to effect monumental change in addressing everything from slavery in supply chains to negative climate change. We owe it to the generations after us to harness that capability and bring people up from poverty, stop greenhouse emissions, build sustainable facilities and much more. This feels awfully presumptuous, but I would hope that my colleagues would describe me as smart, kind and generous. Thank you so much for asking. In the first few years of your career, move around a lot. Make yourself uncomfortable. Look for the challenges and learn how people are solving them. Be generous with your time and your colleagues. Listen. Listen for the good ideas, listen for the winners and the losers. Do not dismiss anyone you meet and ask them all questions about what they do, how they do what they do and what they wish they could be doing. Build your network. Your next job will definitely come from your network. Make sure and meet people, keep appointments and show your gratitude for their time. Make time every week to work on your next big step – a certification, a degree, a new language, a new category, a new strategy, a new tool. Of course, a word about being a woman. I wish things were different today, but I still walk into a room and see less people who look like me than not. This has been happening since I hung up my uniform and put on a suit. I still see instances where men snub their noses and assume since I am in heels I don't have a brain or a worthwhile thought. I still see instances where men get rewarded for hardly trying and women have to fight for every last drop. My advice – fight for your seat at the table. You won't be able to live with yourself if you don't. As you get older, you know what's worth fighting for and how to do it well. So keep up the practice.